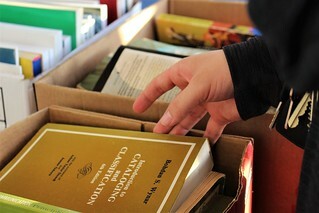 Books are being collected at locations around the Trine University campus and the city of Angola for the Department of Humanities and Communication’s annual HAC Book Night held in the spring. Everyone is invited to attend the event to choose a free book or to donate books to the book exchange. The event, which is free and open to the public, takes place in the Rick L. and Vicki L. James University Center mall, which will have tables of books for community members, students and Trine staff to browse and take several for free. I love HAC Book Night. It's a great celebration of reading and literature. Plus, it gives me and others an opportunity to ‘spring clean’ some books that need a new home, and to find others for the summer. Last year more than 1,000 books were given away to about 300 Trine University students and staff as well as members of the community. Books not taken during the event are donated to Better World Books. HAC Book Night began as part of the international World Book Night event. After that broader event ended, HAC Book Night continued and has been celebrated on Trine’s campus since 2013. For more information, contact Sarah Franzen, Ph.D., assistant professor, Department of Humanities and Communication, at franzens@trine.edu.